47439 accelerates away from the speed restriction at the west end of the Britannia Bridge and heads towards Bangor on 24th September 1976. The train is the 09:04 Holyhead - Euston. 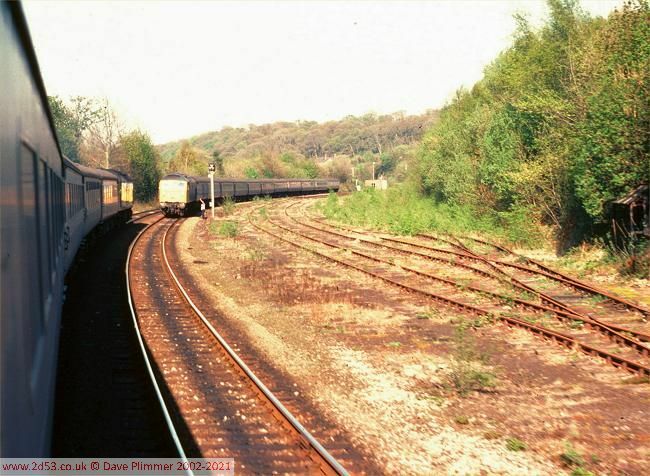 Visible in the background are points No 15, controlled by Bangor SB, that allow access to the single line section for Down trains, together with the sand drag to protect from overruns. A feature of the traffic to the Associated Octel works at Amlwch was the requirement to run extra trains ahead of holiday periods to cover for when trains wouldn't be running. 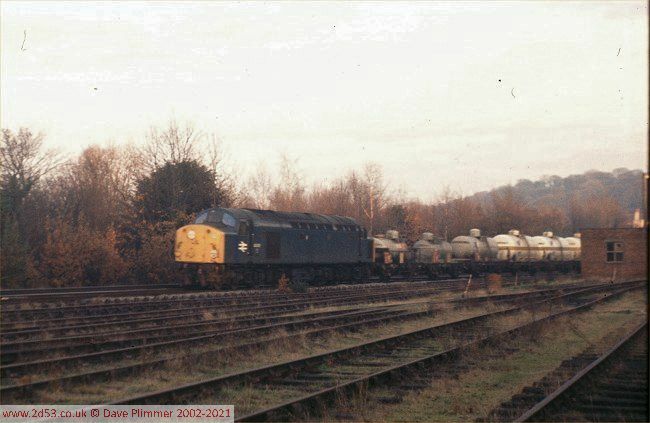 Here we see 40001 making an extra run to Amlwch on the afternoon of Christmas Eve 1976. 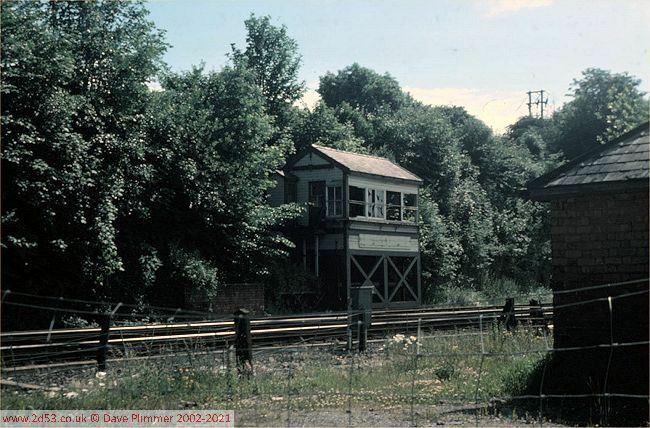 Seen on the 25th June 1976, this was all that remained of Menai Bridge signalbox. Originally controlling access to the Caernarfon branch, it was taken out of use when Bangor box took over control of the new single line over the rebuilt Britannia Bridge as from 2nd December 1973. Menai Bridge goods yard had been opposite the box - one of the yard buildings is seen in this view. The connection from the Down sidings to the Down main line to Holyhead at the western end of the layout was controlled by a ground frame (Menai Bridge Dn Sdgs GF) released by Menai Bridge signal box. After the signal box closed in 1973, the ground frame was retained, renamed as Menai Bridge No 2 GF, and released by Bangor signal box. Menai Bridge No 1 GF was provided to control the eastern connection to the Up line. 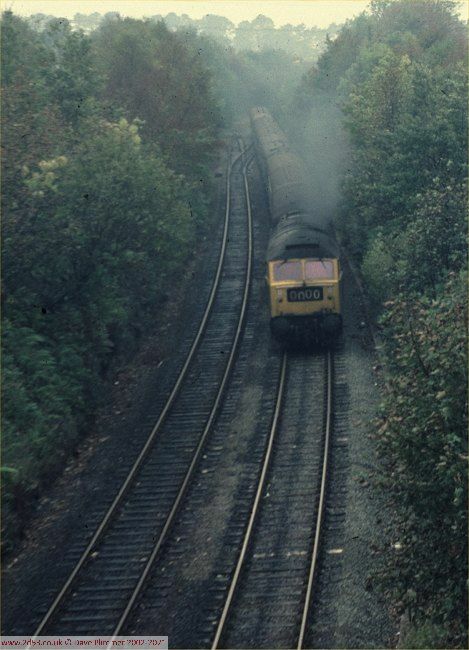 These ground frames were abolished in the mid 1970s, but the western connection was reinstated shortly afterwards as two sidings were required to handle large steel girders for the Britannia Bridge road deck. Here is the entirely new Menai Bridge GF, seen on 25th August 1980 - by which time it was effectively out of use again. The levers were labelled as follows: "1. 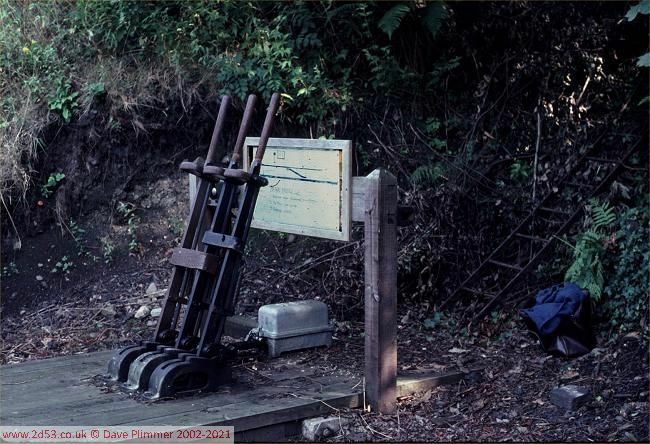 Release Lever (Released from Bangor)", "2. Dn Main Line points" and "3. Sidings points". The sidings are seen here as the driver of 47547, working 1D59, the 1300 Euston - Holyhead, acknowledges the driver of 47445 on 1K36, the 17:05 Holyhead - Crewe as it passes. 1D59 is stopped at signal BR10, awaiting clearance to the single line section across the Britannia Bridge. Pathing of these two trains was obviously difficult. 1D59 had a scheduled wait at Bangor of 4 minutes in the WTT (advertised as 1 minute) and 3 minutes recovery time between Bangor and Menai Bridge. 3rd May 1980.